Planning the Perfect Summer Outfit ~ Roses and Rain Boots . Hey y'all! Did you have a good weekend? I seriously had the best weekend. These types of weekends don't come around that often because we had friends that have seriously turned into family visit for a long weekend. Truthfully the weekend just wasn't long enough. Our family lives on a channel island off of the United Kingdom. Since they live so far away we obviously don't get to see each other often. However; despite how ever much time has passed it feels like no time has passed at all. In fact, it actually feels like just yesterday we were little kids growing up and putting on performances for our parents to watch. I am so grateful to have childhood friends that have turned into family and it's actually because of my dad. My dad had a small group of friends that are no longer "Joe" and "Mark", they are now "Uncle Joe" and "Uncle Mark." Together the three of them showed us, their kids, just how important having a few friends who you allow you to be yourself completely is so crucial in life. As a result of their lasting friendship, our parents raised us to get on (as my english mates would say). And now I have five new friends who I will forever, despite the years that may pass cherish, value and forever be bound too. After all, we have deep roots. While in town we wanted to take them to various touristy attractions, relax by the pool and shop. I wanted my outfits to be comfortable and versatile. Since I knew we would be doing some walking and shopping I wanted a cross-body bag that wouldn't add a ton of extra weight to my shoulders but hold the necessities. I chose this bag from Francesca's (old) because of the pop of colour it adds to the look. Following suit of the bag, I added a not-so-basic white tee, with teal gems for a little glam. I am obsessed with the way the gems catch the sun light and add a little sparkle to my casual ootd. Lastly, since I am always cold I love this sweater from Urban Outfitters (which you can order in the UK) Both my English friends and I are completely on board with these casual, yet chic, oversized sweaters. I am actually crushing on it in light blue one, which I have linked below. Thanks for stopping in! Hope y'all had a fantastic weekend. If you haven't already be sure to stop by my instagram and comment with what you did this weekend. Looking forward to hearing from you. Great post! Great summer look! This is such a great summer outfit and I love the pop of mint green! That's so sweet about your dad and his friends! Love those shoes by the way!!! This is the perfect casual summer outfit! 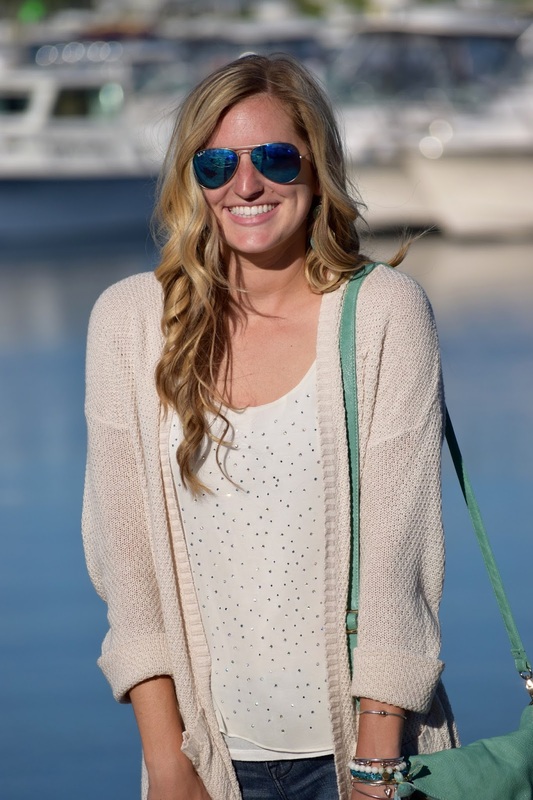 Love the cream cardigan and how you paired it with such a pretty pop of color!